Philippians 2 [1.] If there is therefore any exhortation in Christ, if any consolation of love, if any fellowship of the Spirit, if any tender mercies and compassion, make my joy full, by being like-minded, having the same love, being of one accord, of one mind; doing nothing through rivalry or through conceit, but in humility, each counting others better than himself; each of you not just looking to his own things, but each of you also to the things of others. Philippians 2 [5.] 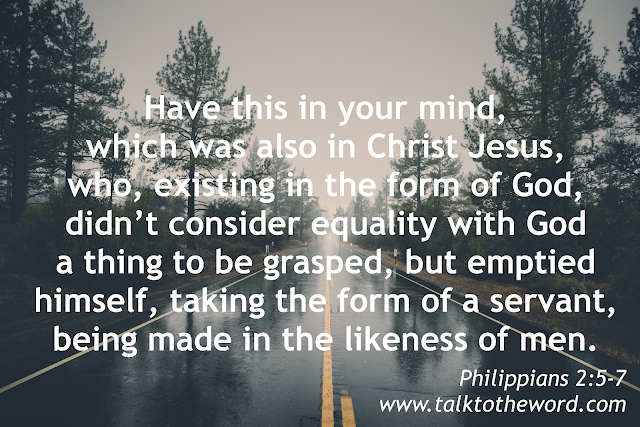 Have this in your mind, which was also in Christ Jesus, who, existing in the form of God, didn’t consider equality with God a thing to be grasped, but emptied himself, taking the form of a servant, being made in the likeness of men. And being found in human form, he humbled himself, becoming obedient to death, yes, the death of the cross. Therefore God also highly exalted him, and gave to him the name which is above every name; that at the name of Jesus every knee should bow, of those in heaven, those on earth, and those under the earth, and that every tongue should confess that Jesus Christ is Lord, to the glory of God the Father.